The Quality Inn Airport Orlando Hotel is centrally located in the city of <?xml:namespace prefix = st1 />Orlando, only a few minutes away from the Orlando International Airport. Several famed attractions such as Sea World Orlando, Universal Studios, and Walt Disney World, outstanding restaurants and stylish shopping malls such as Florida Mall and the Belz Factory Outlet Mall are all conveniently located in close proximity to Quality Inn Airport Orlando Hotel. This beautiful Orlando hotel promises comfortable accommodation suited for both business and leisure travelers alike. The stylish guest rooms feature an array of rich amenities, aimed at creating an unforgettable experience at Quality Inn Airport Orlando Hotel. Throughout their entire stay, hotel guests are treated to a complementary continental breakfast, which features an assortment of delicious fare. For discerning gourmets, this Quality Inn hotel is ideally situated within minutes from popular area restaurants. The Quality Inn Airport Orlando Hotel offers a seasonal outdoor pool and a well-equipped Fitness Center for those guests looking to unwind. In addition to these, golf, tennis and fishing are some of the leisure facilities, located within easy reach of the hotel. Couple all this with the modern business amenities and personalized service at the Quality Inn Airport Orlando Hotel, and it is not hard to fathom why this Orlando hotel is the number one choice for comfortable and affordable accommodation in the heart of Orlando, Florida. The Quality Inn Airport Orlando Hotel offers a delicious complementary breakfast for hotel guests. 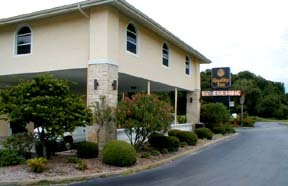 For food lovers, this hotel is also in close proximity to many area restaurants such as Deni's, Olive Garden, and IHOP.